I am amazed at art appreciation books for children that try breaking down art to make it appealing accessible to young children. Books like ‘Can You Find It’ reviewed for ST by Sheela, Tulika’s ‘Looking At Art’ reviewed for ST by Choxbox play an important part in the artistic development of children. These books provide children with positive modeling, nurture their healthy curiosity and more importantly shows how art has changed from the medieval ages to present. Art histroy, in my point of view, teaches children ‘what is art’ is changing and evolving and gives children the confidence that they need not follow some one’s foot steps but can be the torch bearer of change. Children are natural artists, but as parents we often don’t know how to respond to their art because we are not mind readers and because as adults we have already developed our own definition of how art must look like. So we might end up being too judgmental or compliment them in a condescending manner. I love books like ‘Ish’ reviewed for ST by Ranjani because it teaches the adult to appreciate a child’s art and not the reverse. The story opens with Pranav sitting at his desk with a piece of paper, holding a paintbrush. To a casual observer who blindly forwards and lands in the last page, all Pranav has managed to do is to draw ‘just a blue line’. But if you read the book, we are privy to Pranav’s extraordinary imagination. Within six pages, that takes less than 30 seconds for an adult to thumb through, Pranav has managed to imagine a giraffe about to eat grass, but really didn’t because a horse ate all the giraffe’s grass, leaving the giraffe in tears. Meanwhile a boy mounts the horse and gallops to his house, a house with A-line roof, one door and two windows to be specific, gets in to bed and goes to sleep, which is depicted by the blue line. Pranav ends up teaching us a valuable lesson, sometimes there is more to what you see and adults have to respect the process and not the product. Another reason I fell in love with Pranav is because he reminds me of my all time favorite Harold of Harold And The Purple Crayon. That Harold….with his blue pajamas and his purple crayon he is such a riot. If he wants to walk on something he makes his own straight path and then realizes that a straight path is no fun because it leads no where. He wants excitement so he makes his own adventure like walking in to a forest, creating a scary dragon and ends up getting scared by his own imagination. Half way in to his adventures, Harold realizes that he wants to go home and the rest of his adventure is getting himself home. Harold is frantically trying to find the window of his bedroom in the hundreds of windows that he drew. Then he realizes that his window is ‘always right around the moon’. Sounds like the Akbar-Birbal story in which the guy looses his golden ring some place but is looking under the street light because there is plenty of light under the street light right?! This is the thinking process of a preschool child. Because of their limited life experiences and cognition, they often distort reality in order to fit what is happening to them. Harold is Piaget's pre-operational child, to the T.
Suddenly at the age of five or six, because their thought process is becoming more concrete, because children are looking for logic instead of warping reality to fit what they know, the creative process takes a hit. When you give them a paper, put them on the spot and ask them to draw all they can draw is a blank. Then comes the whining, ‘But, but….. I don’t know what to draw. Can you help me?’ That’s it. The adult then rolls his/her sleeves, either demonstrates or gives ideas and the art transforms to the adult’s art. It is no longer the child’s. As a parent or as a teacher what do you do? How do you encourage the child to create? 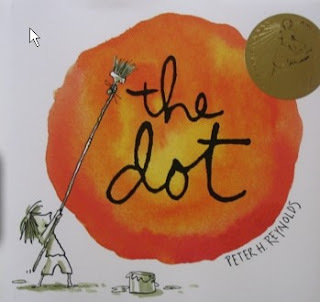 Peter H Reynolds tackles this in his The Dot. The teacher in this book, looks at Vashti’s blank paper and asks her if it is a polar bear in a snow storm! She then encourages Vashti to make a mark. This leads Vashti to create a gallery full of paintings. My children have read these books countless times because in their little minds, all that Pranav, Harold and Vashti do makes perfect sense and it is F.U.N! This reminded me of something that happenned almost a year ago. My daughter was then 7 and enjoyed drawing. She, however, had started limiting her drawings to the typical village scene where there are mountains in the distance with a rising sun and houses in the foreground. She would get very annoyed with her own drawings. Then a sister-in-law who is an artist and teaches art to children stepped in. She drew a series of eggs and proceeded to transform them into flowers, butterflies, sheep, ducks, etc. You get the picture. That started my daughter off who would ask me to draw a series of any weird shape, and proceed to transform them into so many different things. It was amazing! Wonderful, utbt, very informative post! Harold and the Purple Crayon and Dot are faves in our household, and I found myself nodding along emphatically at some of your insights and notes! "Because of their limited life experiences and cognition, they often distort reality in order to fit what is happening to them"
"When you give them a paper, put them on the spot and ask them to draw all they can draw is a blank." 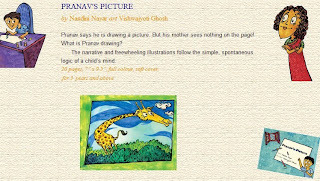 Pranav's Picture reminded me of exactly the same book - Harold and the Purple Crayon! Awesome books both! 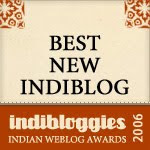 @Sandhya: Thats such an interesting idea! all three books are much loved in this household!. esp Pranav's picture. good list! @Sandhya, thanks. Reminds me of my chithi. The last time she visited, she drew nos, from 1 to 9, turned each no to a shape and made a story out of the whole thing. My girls went ga-ga over the whole thing. Predictably every part of our drive way was covered with numbers made with sidewalk chalk. So intriguing! Am going to see if these books are on hand here.. Very interesting picks UTBT ! Should check out all these books soon. We love Pranav's Picture here - it's really a wonderful book, says a lot without sayin much at all. 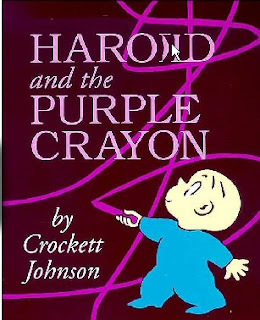 I've heard so much about Harold and the purple crayon, have to lay my hands on it. T, Ranjani try it and tell us what you think. I am sure you will both love Harold. Poppy, exactly! Saying much without saying much. utbt: Came across 'The Missing Piece' by Shel Silverstein today. Reminded me of Harold - maybe because of the simple and uncluttered layout. Awesome. Okay, so we just read Harold and the Purple crayon. And...OMG! OMG! OMG! What an amazingly simple but powerful concept and depiction. I am jus entranced with the linking from one situation to another to another to another, until we come back to familiarity once more, with the bottom line being....anything's possible from the tip of your hands. Wow!! I read it with Sathya so far and he wanted to just sit and look thru the pictures on his own after that. Have ye tto read it with Akhil and I have no doubt how that's going to go down! Thanks for this awesome reco! Lovely, UTBT. We have both Pranav's picture (thanks to M!) and Harold. Post your review, I have enjoyed reading them both together to my three old. Her thing is the balloon. She would draw them in all colors and patterns. And would draw a family of them - mamma balloon, pappa balloon, sister and baby...It's amazing a simplistic drawing of a balloon can help a child explore so many elements of artistic side. The depth children can take you in art can be awe-inspiring!